Sometimes all it takes to make the perfect cupcake is finding the perfect plastic topper. Check hobby shops, chain retailers, online cake supply stores, and so on for baby shower themed decorations such as babies, buggies, pacifiers and bottles. 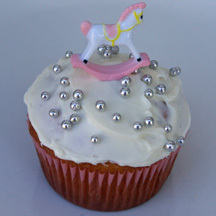 What You Need: 1 cupcake; white frosting; plastic rocking horse; silver dragees (the USDA considers these inedible, and supposedly they can’t be sold in California, but my mom had some in her cupboard). How to Make It: Frost cupcake. Add plastic topper. Sprinkle with dragees. For this little lion, all you need are candies — no special tips or tubes required. If you don’t have these exact candies, just pick something you do have. 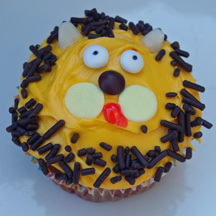 What You Need: 1 cupcake; frosting tinted a deep yellow; chocolate sprinkles (mane); 2 large Wilton sprinkles (cheeks); 2 small white candies (eyes); brown mini M&M (nose); pink gel icing (mouth); 2 candy corns (ears); black food-safe pen. How to Make It: Frost cupcake. Sprinkle chocolate sprinkles around the entire edge of the cupcake for mane. Use black food-safe pen to write pupil on white candy eyes. Add candies to make face as shown. Red mini M&Ms are sprinkled on these easy red, white, and blue cupcakes for Independence Day. 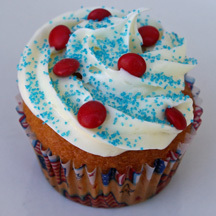 What You Need: 1 cupcake; white or off-white frosting; red mini M&Ms; blue sugar; 1M metal tip; pastry bag. How to Make It: Use white frosting and metal tip in pastry bag to make 1M swirl (start at the outside of the cupcake and work inward and upward). Sprinkle with blue sugar. Add red M&Ms.